An article on a bill to reinstatement federal PEG monies for community television stations appeared on the cover of today's Wisconsin State Journal. WYOU, Madison's only access station, has been struggling to survive over the last couple of years after the state voted to cut their funding. Yet whether this valuable new source of income comes through or not, the future for WYOU recently took a turn for the better. In an agreement between the Madison Public Library and the cable access station, WYOU has now taken up residence at the newly refurbished downtown location...rent free! Madison's community voice has a secure permanent home. Robert continues to write and update the program schedule each week for the station. 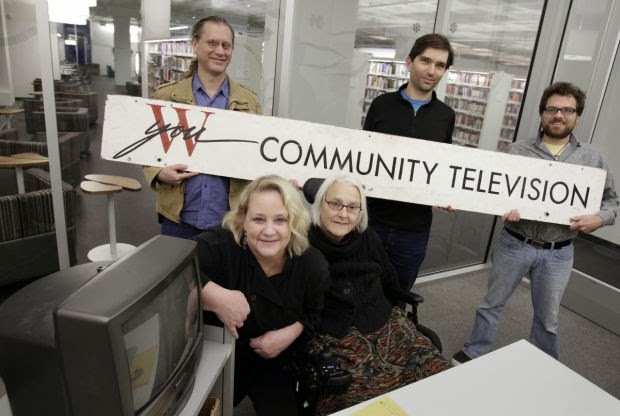 Pictured at the library holding a vintage WYOU sign is Robert along with board members Bryan Fay and Michael Haven. Seated in front are board members Barbara Wright and Barbara Vedder. Photo copyright M.P. King, State Journal.